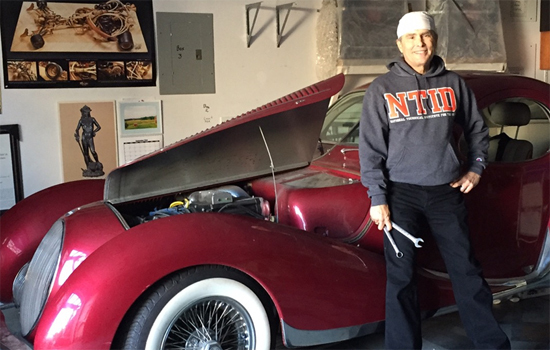 Henry Navas ’74, ’77 takes a break from working on his reproduction of a 1936 Talbo-Lago, just one of his many hobbies and interests. As a member of RIT’s Board of Trustees and a life-long learner, 2016 Saunders College of Business Distinguished Alumnus Henry Navas ’74, ’77 is keenly focused on the education of all those who attend RIT and, perhaps even more so, of those who have since graduated. Navas’ desire for this type of continuing education is due to the lessons he learned beyond the classroom. While he credits his education for providing him with excellent technical skills, Navas wishes additional skillsets had been built into his programs at RIT. These skills have proven more than beneficial for Navas. After working at Xerox for more than 12 years, he left Rochester to pursue a career in Silicon Valley. He eventually found his way to Cisco, when it was a company of just 50 employees. While there, Navas became treasurer and helped to launch Cisco’s successful initial public offering in 1991. Navas isn’t consumed with balance sheets and profit and loss statements, though. This is not just because Navas is now semi-retired, but because he feels strongly that people need to infuse the technical side of their education and careers with the social sciences and humanities. His continuing education has included taking courses in anthropology, cosmology, physics and poetry. He envisions RIT offering the same type of opportunities for its alumni in the future. Furthermore, Navas believes that a little bit of fun should be had as well. Navas will be sure to sport his tuxedo April 15 when he is honored, along with nine other alumni, with the 2016 RIT Distinguished Alumni Award (DAA). He will also participate in a variety of events on campus during DAA Week, April 11-15, which he is looking forward to. The Distinguished Alumni Award is presented to a certified alumnus/a who has performed with distinction at the highest levels of his or her chosen profession; or who has contributed significantly to the advancement and leadership of noteworthy civic, philanthropic, or service organizations over the course of many years. Those honored have brought distinction to their colleges and RIT through their professional, community and/or philanthropic achievements. Check back every Thursday for more from RIT’s 2016 Distinguished Alumni.